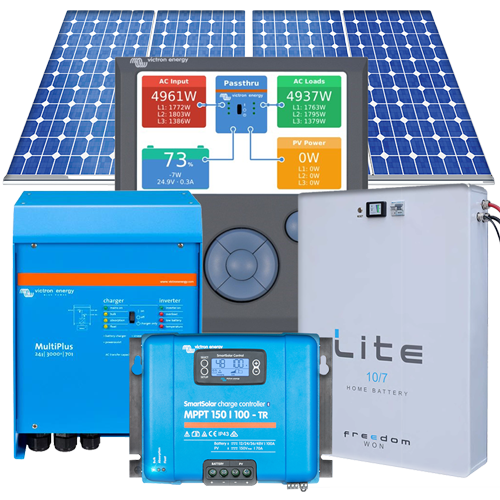 Specialized Solar Systems popular mid-level 5kVA 24kWhr per day with Lithium Iron Phosphate 7kWhrs Grid-Interactive Hybrid Solar System. Generating a daily average of 24kWhrs with a battery storage that supports 7kWhrs of daily electrical energy usage. 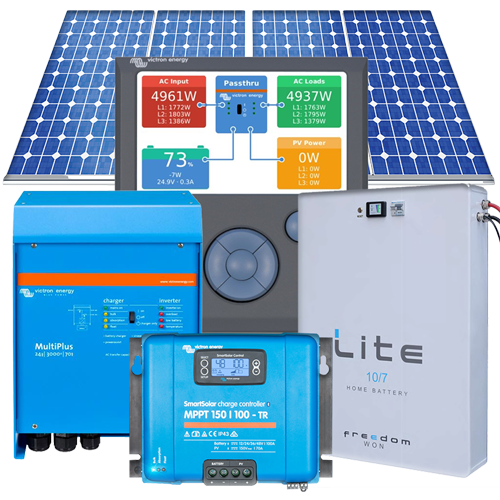 This complete Grid-Interactive Hybrid Solar System has been specially designed by Specialized Solar Systems. Using superior quality solar components, this solar system will supply our customers with a daily average of 24kWhs of solar-generated electrical energy per day from the solar panel array. It comes with a Lithium Iron Phosphate Battery with a storage capacity that will support 7kW hours of daily electrical energy usage directly from the battery, before reaching a 70% depth of discharge (DOD), therefore maximizing the batteries lifespan. The battery is guaranteed for 10 years at a 70% Depth of discharge (DOD) or less. 1 x Freedom Lite 200AH 48V Battery – Usable 7kWhrs @ 70% DOD – 10 Year Manufacturer Guarantee. 1 x 100Amp MPPT-TR (Maximum Power Point Tracker) – 5 Year Manufacturer Guarantee. 1 x Victron Color Control GX Online Monitor – 5 Year Manufacturer Guarantee. System installation, programming and maintenance/owner Training – 1 Year Workmanship Guarantee – please enquire about options.